Mass cancellations for Hawaii – a reality for the Island of Hawaii. 20-30 % of future tourists to Hawaii Island are canceling, according to local tour operators. The Hawaii Tourism Authority (HTA) is up to the neck in unrelated problems and under attack by the legislator and an internal audit for mishandling money, inside deals. According to insiders, there is a great and safe opportunity for HTA to promote travel to Hawaii Island to an audience not looking for sand and sea. What is happening on Hawaii Island is a once in a lifetime opportunity also for the tourism industry. Tourists wanting to see the volcano (from a distance) should be traveling to Hawaii Island. Forget about the beaches for a minute, don’t worry about outdoor sports that much and put such activities on a sideline. Instead of reaching out to this different type of tourists interest in the geological activities, HTA is hiding or completely downplaying the unpleasant side what comes with the volcanic eruption – air quality. The truth is, traveling to Hawaii island is ok, but not necessary to get a sun tan at the beach. Many in the world are hungry to learn more about Hawaii Island and the volcano. A great opportunity for universities, colleges, schools, geological associations, adventure travel clubs, environmental groups from around the world to get on a plane to Kona or Hilo. When studying gohawaii.com, the official tourism website by the State of Hawaii, there is no mentioning of vog or volcanic air when reading about Hawaii Island. Tourism is big business here. Kailua Kona on Hawaii Island is known as the sunny side of the island and stretches almost two-thirds of the entire West side of the island of Hawaii—from just south of Anaehoomalu Bay (Waikoloa Beach Resort) to Manuka Park (Kau). Along with this expansive area, tourists find everything from coffee farms to historic Hawaiian landmarks. In fact, King Kamehameha actually spent his final years in Kailua-Kona. There is no prominent link from gohawaii.com to get to a page hosted on that website https://www.gohawaii.com/trip-planning/weather but when searching for the word “fog” one can find this information. Vog is the local term for “volcanic fog” and it describes the hazy air pollution that occasionally hangs over the islands. Vog is caused when sulfur dioxide and other gasses from Kilauea’s Halemaumau Crater (Big Island of Hawaii) mix with moisture in the air and sunlight. Under extreme conditions—when the volcano is active and the winds carry the fumes north to the rest of the island chain—vog can be hazardous to plants, animals and humans. The most common effects are headaches, watery eyes, and breathing difficulties. These effects can be especially pronounced in people with respiratory conditions and young children. It is not advisable to exercise or participate in strenuous outdoor activities when the vog is very heavy. Depending on your personal sensitivity, you may want to learn more about vog before traveling to Hawaii Island and visiting HAWAII VOLCANOES NATIONAL PARK. Unfortunately, the Hawaii Volcanoes National Park has been closed by US Authorities indefinitely. Tomorrow, Friday may just be one of these days and already on Thursday night the air quality for the resort town Kaila Kona is in the “Unhealthy” status. 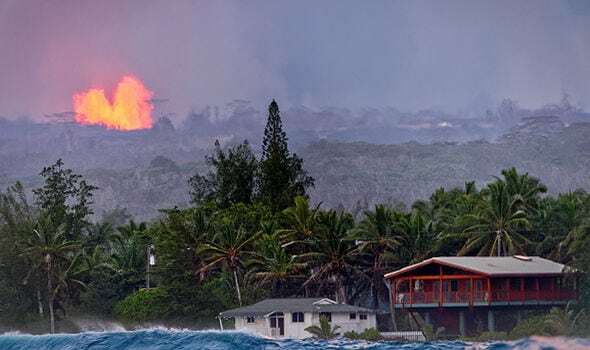 Kona’s air quality depends on the trade winds.“When active, the trades, blowing northeast to southwest, keep the bulk of Kilauea’s vog away from the Kona-Kohala coast. The Hawaii Tourism Authority wants to promote tourism as usual to Kailua Kona and Hawaii Island, but it’s not. An advice to tourists still wanting to go on vacation in Kailua Kona: Reduce long or intense outdoor activities. Take more breaks. If you experience coughing or shortness of breath, take it easier. If you have asthma, keep quick-relief medicine handy. People with heart disease: If you experience palpitations, shortness of breath, or unusual fatigue, contact your health provider. An advice to tourists wanting to travel to the beaches on Hawaii Island. Go to Maui or Oahu. An advice to the millions of adventurists wanting to experience something in the world they will never have a chance to experience. Visit Hawaii Island now and stay a little longer on Oahu, Kauai, Maui, Molokai or Lanai for the sand and sea.